The Palace of Happiness or Marriage House in Baku has opened its doors to all couples in love after its full reconstruction. The newly reconstructed building has regained its historical looks. The first part of the palace is designed for holding business meetings and official receptions, while the second part - for weddings. The building has an indoor terrace. The building has a solemn ceremonial hall designed in classic style and a VIP reception hall in rococo style, as well as a dancing hall and a waiting room. This enchanting building, the most beautiful architectural pearl of Azerbaijan, was founded by Azerbaijani oil tycoon Murtuza Mukhtarov. It has a very interesting and fascinating history, which could be an inspiration for poets and romantic writers. Feelings materialized in this delicate and elegant palace, which has delighted local people and tourists for more than a century with its beauty and amazing architectural harmony, looking like a castle in fairy tales with its high vaults, stone gargoyles and dragons, languidly sitting in the roof. This is a monument of true love, which has experienced a lot of its characters in its history. The founder of this ``castle`` was very resembling to his mansion. Despite being born to a poor family and not having access to formal education, he managed to become a highly-qualified, self-taught engineer and one of the best specialists in Baku. His enormous experience and shrewdness propelled him into his own business in 1890 when he became the owner of an oil company with two divisions, employing 2,500 workers, which manufactured machinery for derricks and bored new oil wells. 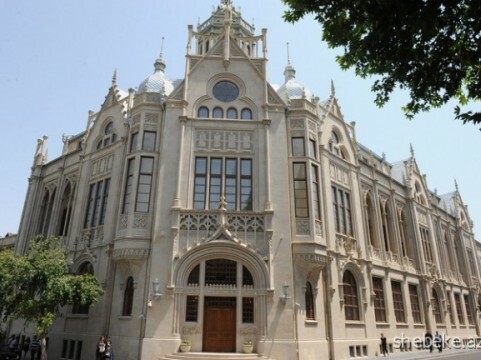 The palace was built in 1911-1912 by the Polish architect I. K. Plosko, who designed many architectural buildings in Baku. The building was Mukhtarov`s present to his lovely wife Liza Khanum Taganova, who was astonished by the beauty of a similar building towered up in Venice in the French Gothic style. ``How happy the tenants of this building must be,`` she said looking at the construction in Italy. The palace was designed in French Gothic and Rococo style. Expressive silhouette composition of the house stands out not only in the surrounding buildings, but also in the urban landscape. In 1914, the Mukhtarovs` Palace became the residence of the first Female Moslem Philanthropic Society founded by Liza-Khanum. Together with her husband, she financially supported many of these girls so they could continue their education in Moscow and St. Petersburg. Mukhtarov shot all ``undesirable guests` riding horseback through the great halls of his mansion and then killed himself. Liza-Khanum was forced to live in the basement of this very same palace which had been built for her. Deprived of everything she owned, she managed to escape with a diplomat to Istanbul, where she died in 1957. This soaring castle incarnated the love and happy family life. But the destiny of its owners was far from this. The house couldn`t bring mirth to the Mukhtarovs` hearts. But today, young couples link here their bond of love and family, sincerely rejoicing. And each time pieces of happiness absorb to the silent walls of the mansion. Even if Mukhtarov`s ghost wanders about the house, he is happy. If only because his creation brings happiness to people which he did not get.